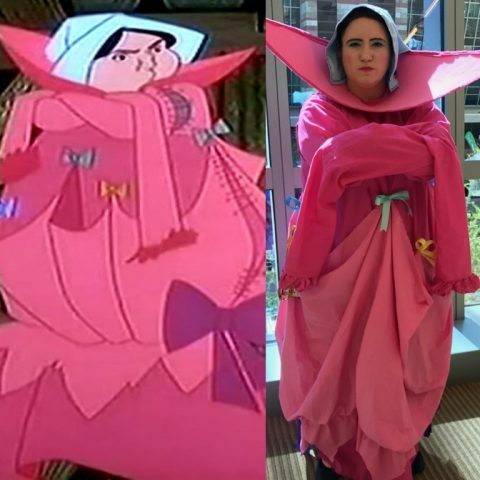 Cosplayer Gets an Obscure Sleeping Beauty Costume Just Right « Adafruit Industries – Makers, hackers, artists, designers and engineers! When I think of Sleeping Beauty costumes, Aurora and Maleficent come to mind. I’ve seen a few takes on the fairies who raise Aurora, Flora, Fauna, and Merriweather, too. But I’ve never seen anyone tackle Merriweather in the pink dress the fairies attempted to make for Aurora without using magic. They weren’t so successful at following a pattern and creating the beautiful gown they pictured in their heads. Redditor Hauntmom87 made a replica of the failed attempt. She nailed it from the collar to the lopsided lumps to the bows. She didn’t share notes about the making of process, but it’s such an original idea it had to be seen. Keep up with more of her work on Facebook and Instagram!